In a society increasingly curious about the way food is produced, plenty has happened to foster skepticism toward farmers. In a society increasingly curious about the way food is produced, plenty has happened to foster skepticism toward farmers who may have taken for granted the public trust they’ve historically enjoyed. Undercover video investigations showing an uncaring attitude cause people to question today’s farm animal caretakers. The debate over gestation stalls and egg laying-hen battery cages cause people to question the technology used in today’s agriculture. Consumers have traditionally trusted farmers because they believe farmers share their values. But consumers aren’t sure today’s agriculture still qualifies as farming. 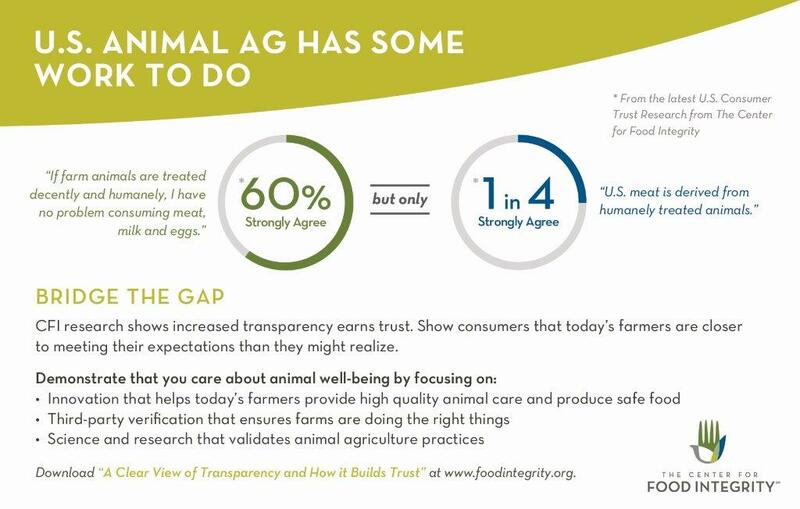 While there’s significant concern that animals raised for food are being treated humanely, much is happening that might show consumers that today’s farmers are closer to meeting their expectations than they might realize. Innovation helps today’s farmers provide high quality animal care. Collaborative research is addressing not only animal welfare, but worker safety, environmental impact and food safety. Third-party verification ensures farms are doing the right things. Innovative precision care systems use online communications to monitor animals. Real-time video monitoring detects problems with climate control or malfunctioning water and feed lines to keep animals free from hunger, thirst and discomfort. Raising pigs and chickens indoors protects them from predators and weather extremes. The Coalition for Sustainable Egg Supply is an example of food system research collaboration. In an era when research funding sources are drying up, a group of around 30 animal welfare scientists, academic institutions, NGOs, egg suppliers, restaurants and food retailers joined to evaluate various hen housing systems and their sustainability. The study found that there are tradeoffs between each and no single system is better than another when it comes to such things as animal welfare, worker safety and food safety. The research was applauded by the National Academy of Sciences. The National Dairy FARM (Farmers Assuring Responsible Management) Program details animal care guidelines on important areas such as health, housing, animal handling and transportation. The integrity of the program is ensured through third-party verification. More than 90 percent of the nation’s milk now comes from dairies that are FARM-certified. The beef, pork, egg and poultry sectors all have similar programs. Still, more work is necessary to engage consumers to build trust. Research proves that increased transparency is critical to the process. Healthy strides in demonstrating transparency are as important as technology and innovation advancements in building consumer trust. Some farms and food companies have embraced this reality and are pulling back the curtain. Fair Oaks Farms, based in the Chicago area, has more than 35,000 dairy cows – an operation many consumers would likely consider a so-called “factory farm.” The founders of the company say they have nothing to hide and want people to see how animals are cared for. Thousands of people take tours through the farm annually to see for themselves how pigs are housed indoors and how cows are treated as they produce our milk. California-based JS West, an egg producer, has installed video cameras on its farms. The public can go to the company’s website to watch the movement of hens in an enriched colony system and view their perching and feeding behavior in real time. Visitors to the site are welcome to leave comments about what they see. Some of the largest food and beverage manufacturers in the U.S. have announced a project to provide shoppers access to detailed information through a code on packaging that can be scanned. Consumers will be able to use a smartphone to instantly obtain details on animal welfare and other issues, including whether the food contains GMOs. Consumers understandably have difficulty identifying with today’s food producers. Over the last half-century, agriculture has changed much like other sectors. Smartphones have changed the way we communicate. Online services have changed the way we shop, bank, and entertain ourselves. Most people appreciate the convenience and efficiency of new technology. Advances in agriculture aren’t appreciated in the same way because so few people are involved in farming. As consumers are bombarded with conflicting information it is understandable new technology is being met with skepticism and society’s increased demand for transparency must be satisfied. While the demand for more information is accompanied by an obligation for consumers to objectively examine the data and focus on the need for safe, affordable, responsibly-produced food, more farmers must embrace skepticism and communicate in a transparent manner. In that regard, there’s work to be done. Charlie Arnot is CEO of The Center for Food Integrity, a not-for-profit organization that helps today’s food system earn consumer trust. Members and project partners represent the diversity of the food system. The Center does not lobby or advocate for individual companies or brands. For more information, visit www.foodintegrity.org.